As porch sitting bourbon season rolls right in with speed, I was taken with this simple recipe for an cast iron cooked rib-eye steak with a smoky chipotle and bourbon sauce. 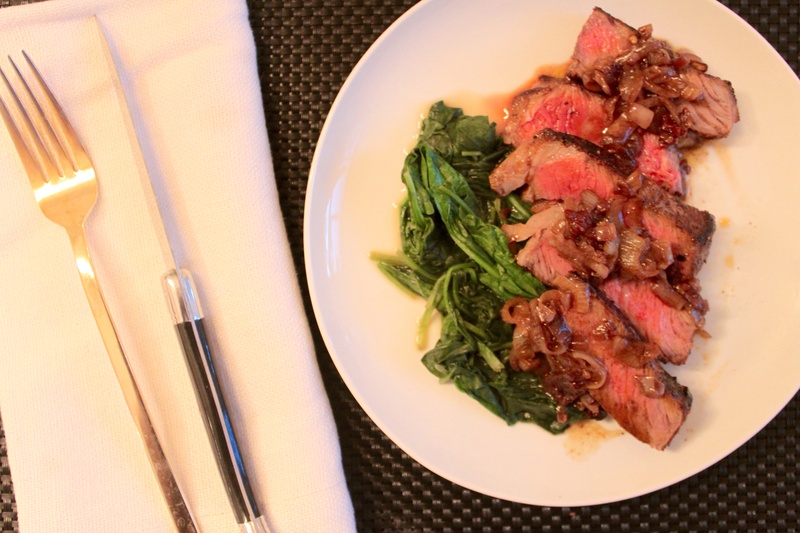 While meat selection is incredibly important, the sauce for this steak is what stands out. I added extra shallots for texture and enjoyed the taste of spice with undertones of great bourbon. With a simple braised green or potato, this is the perfect Friday night meal by the fire. In a small bowl, combine the cumin, paprika, 3/4 tsp. salt, and 1/2 tsp. pepper. Rub all over the steak. Heat a 10- to 12-inch castiron skillet over high heat for about 2minutes. Sear the steak until well browned on one side, about 5 minutes. Flip and transfer the skillet to the oven. Roast until done to your liking (120°F for rare; 125°F for medium rare), 12 to 15minutes. Transfer the steak to a cutting board. Put the skillet over medium heat, add the shallot, and cook, stirring, until fragrant, about 1 minute. Add the chipotle and cook until fragrant, about 20 seconds. Remove the pan from the heat, add the bourbon, and swirl until the sizzling stops. Return the pan to the heat and add the broth, scraping up any bits stuck to the bottom of the skillet. Bring to a simmer. Swirl in the butter until melted. Remove from the heat.